An award winning a Tele-Drama on Aids (Prix Futura -youth category - 1991). 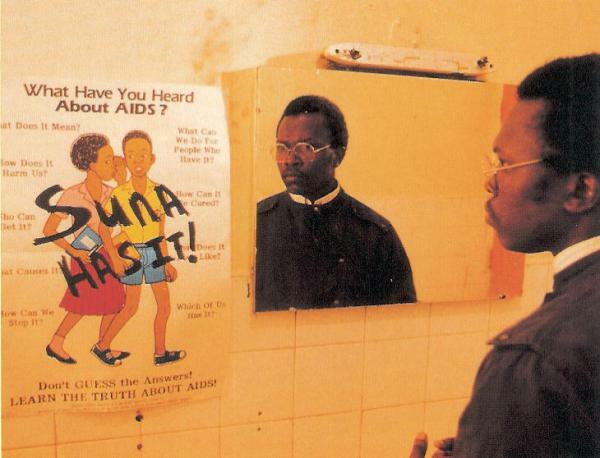 "It's Not Easy" was the first AIDS drama produced in Africa and tells the story of Suna, a young, married business executive with several girlfriends, who ignores warnings about AIDS. Career, family and a nice girlfriend are all going well for Suna, a young African business executive. But everything changes when his newborn son is found to be infected with HIV - the deadly AIDS virus. It's Not Easy, but neighbors and co-workers learn to become allies, instead of enemies, in the battle for life. The movie is an anthem in Africa's struggle against the AIDS plague. French, English, Swahili, Luganda, siSwati, Setswana, Zulu, Runyankole. VHS NTSC or PAL US$29.95. DVD NTSC English or DVD PAL English, French or Swahili US$29.95. - 48 minutes. Discussion guidelines, research report and photonovela also available. Produced in Uganda by John Riber with support from USAID/Kampala, AIDSCOM, AED, JHU, EIL, FUE and DSR. This dramatic film was made in Uganda. It has won eight awards: National Council on Family Relations, The New York Festival, Medikinale International Parma, Prix Futura - Berlin, Int'l Communications Industries Association, Black Filmmakers Hall of Fame, the British Medical Association, Cinevue and FESPACO. This movie is available in streaming format. Groundwork in HIV/AIDS Cinema, Honorable Mention Award, ICASA Film Festival, Nigeria, 2005.